A relationship with modern computing (i.e., the digital age). A relationship with the cutting edge of modern technology. What Type of Word is Cyber? Note: Like many compound nouns (especially modern ones), those featuring the word "cyber" can be written as one word (cyberspace), as two words (cyber space) or as a hyphenated word (cyber-space). There is no clear guidance on this, but usage will eventually dictate which versions are acceptable. For now, try the one-word version and if your spellchecker dislikes it, go for the two-word or hyphenated version. Cyber Attack. A cyber attack is a standoff attack to disrupt, disable, destroy, or control a computing environment or to access controlled information. Cybercrime. Cybercrime is any crime which is carried out using information technology or which targets information technology. Cyberspace. Cyberspace is the environment where data storage and communications using computer networks occur. The word "cyber" came to prominence with the term "cybernetics" (the scientific study of controlling and communicating with systems using technology), which was coined in 1948 by the American mathematician Norbert Wiener (1894-1964). The word "cyber" originates from the Ancient Greek verb kybereo meaning to guide, to steer, or to control. 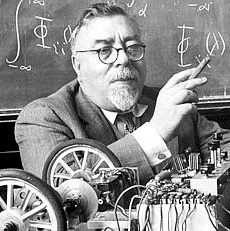 American mathematician Norbert Wiener coined "cybernetics" in 1948.